Core Classes are Reclaiming Courses which have been designated by the Bay Area Teachers' Cells as the basic curriculum in the Reclaiming Tradition. Most of these classes have been taught continuously in the Bay Area, around the U.S and the world for over 35 years. Completion of one or more of the Core Classes may be a prerequisite for other classes. Elements of Magic - With the art of magic, we deepen our vision and focus our will, empowering ourselves to act in the world. In this class we begin the practice of Magic, Witchcraft, and goddess/god/mysterious ones spirituality by working with the Elements of Magic: Earth, Air, Fire, Water, and Spirit. 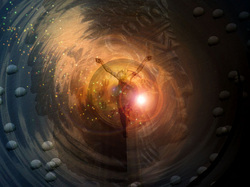 Techniques include: visualization, sensing and projecting energy, chanting, trance, creating magical space, spellcraft, and structuring rituals. Group experience follows feminist consensus process. This class is often a pre-requisite for other Reclaiming classes and witchcamps. Typically offered as a six week class or weekend intensive. Pentacle of Pearl - We will work with the deep, healing energies of the Pentacle of Pearl, moving through the five points: Love, Law, Wisdom, Liberty, and Knowledge. The Pearl Pentacle is a powerful tool for integrating our personal vision with our work in community and in the wider world. Through movement, meditation, trance, and ritual, we will explore, deepen, and heal our connections with the points of the Pearl Pentacle. Using magic we will delve into the myriad ways these powerful forces can be shaped and channeled in our internal growth, our actions, our relationships, and our work in community. Typically offered as a six week class or weekend intensive. Rites of Passage - Rites of Passage focuses on dreams, myths, and language, using traditional and non-traditional tales and techniques to create a personal rite of passage. Through storytelling, trance, release work and dreams we receive our challenge(s), meet our helpers, work through our blocks and emerge renewed, reborn, culminating with a ritual created by the students. Typically offered as a six week class or weekend intensive. Prerequisite: Elements of Magic class or equivalent. Community Class - We live in a world where we move in and out of many communities - neighborhoods, planning groups, covens, witchcamps, families, households…. We dance in community connecting, supporting, engaging and celebrating. We also, at times, walk in community disempowered, frustrated, isolated, and burnt out. This is a class that engages the tools that transform the walk to the dance. Through discussion, interactive exercises, play, ritual and trance, we explore and gain insight and tools to grow and sustain healthy, vibrant communities. This class is focused on creating community in the Reclaiming Tradition and its ally communities. Typically offered as a six week class or weekend intensive. Photos used under Creative Commons from Eddi van W. R. S.